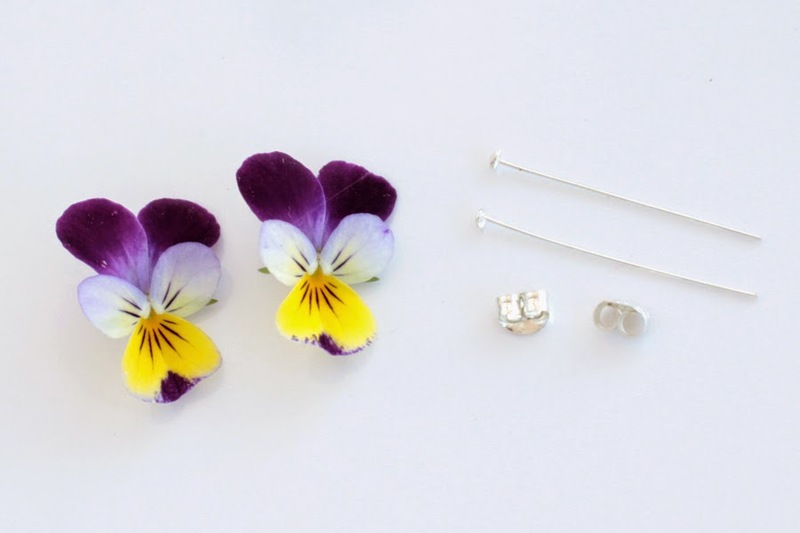 You’ll want to pick a stud finding that is similar size to the cabochon so that the glue has more surface to stick to. If the post finding is too small it won’t be strong enough to hold the cabochon. Lots of jeweller’s use E6000 as it’s one of the strongest glues for metal, just be warned that it does have rather toxic fumes though (will give you headaches). 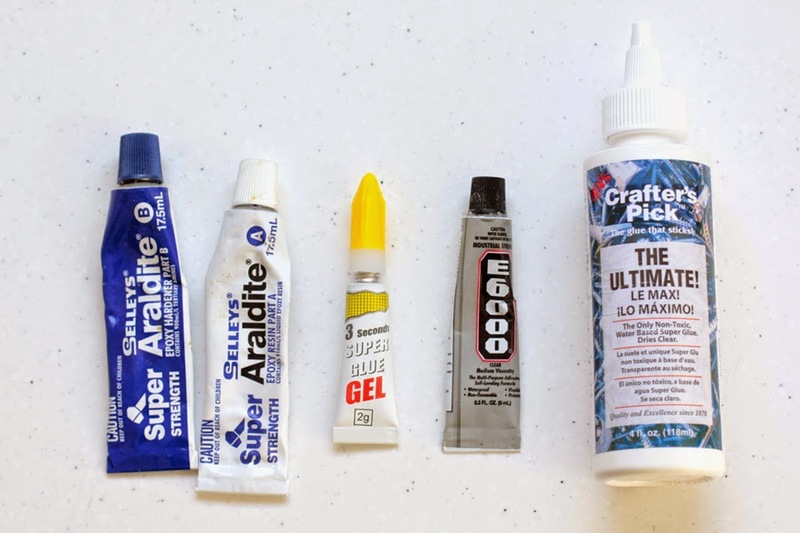 I prefer to use a non-toxic superglue (such as Ultimate Glue by Crafter’s Pick) or mixing a small batch of non-toxic epoxy resin (such as Little Windows). 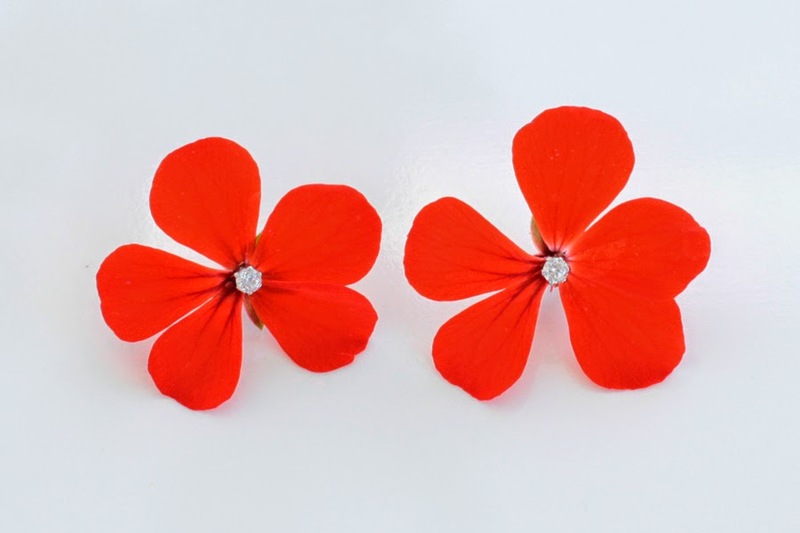 Make sure to double check the size of the cabochons when you’re ordering them – they can range from a couple of millimetres up until several centimetres and the photos can be a bit misleading sometimes. I’ve had great experience ordering these direct from China (on ebay). 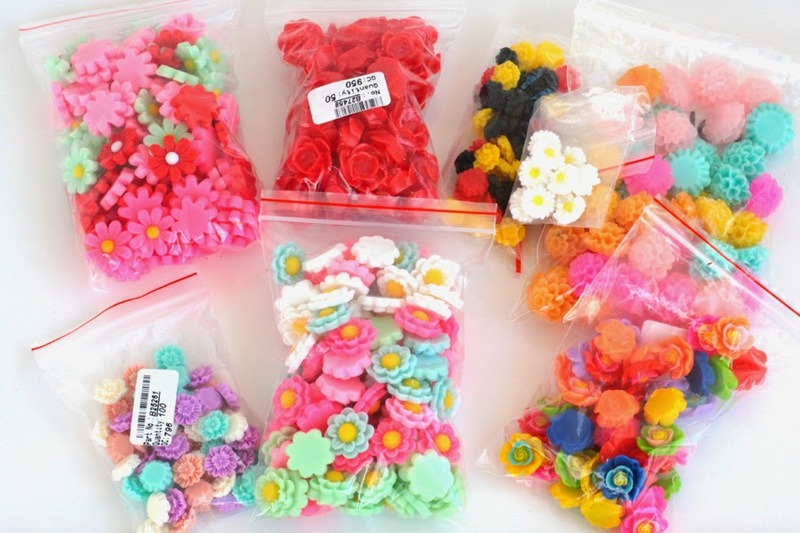 You can get all sorts of bulk lots for less than $4 and they pretty much always offer free postage (although it does usually take a couple of week to arrive, sometimes even up to a month). 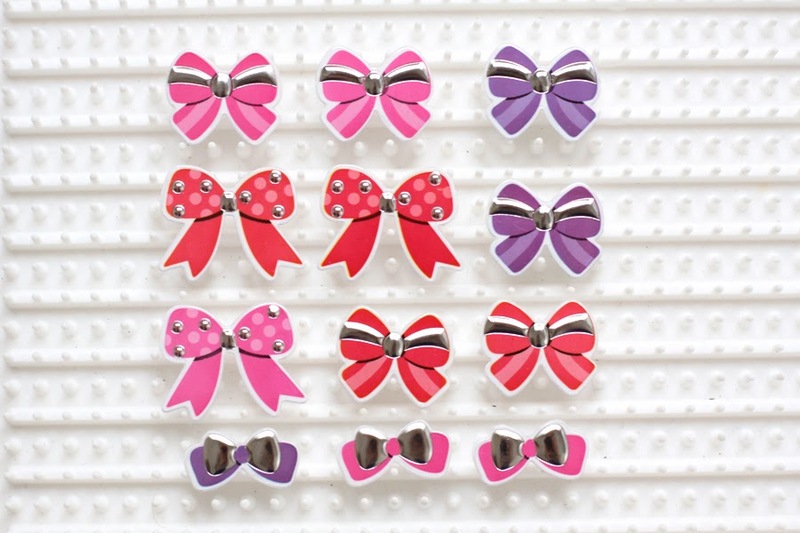 Watch out for sellers on ebay or Etsy that sell mixed packs of all sorts of different colours and styles. They are usually a little more expensive but worth it if you don’t want to end up with a number of bulk lots with heaps leftover. 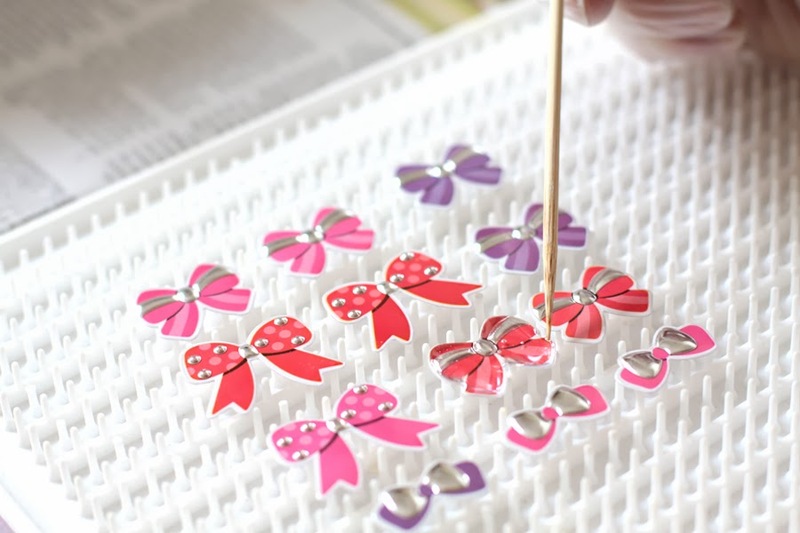 A hope to do a few more DIYs with these in the near future but a few ideas include glueing them to ring findings, sunglasses, bobby pins, shoes, a clutch or a headband. 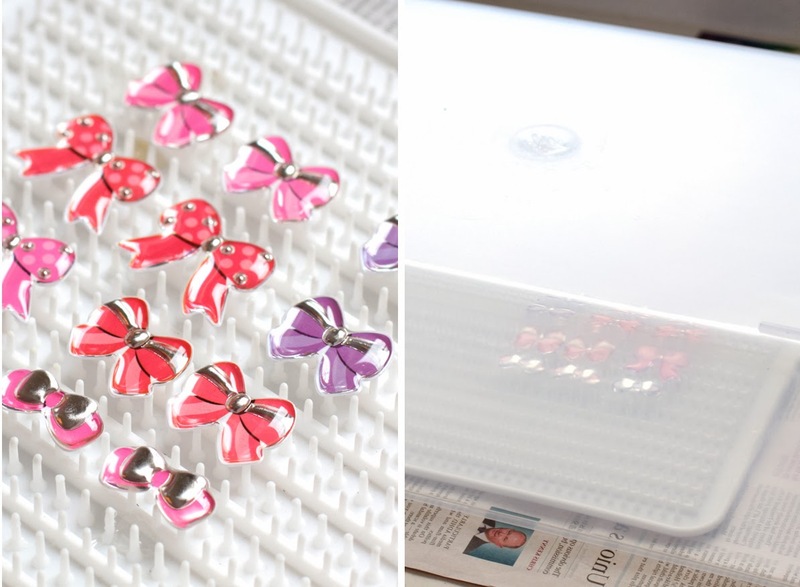 You can drill a hole in them to create a bead. 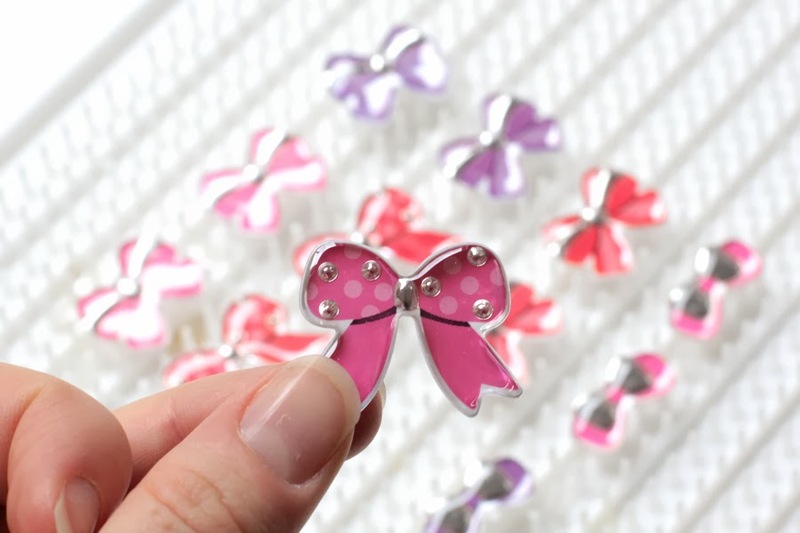 You could glue a magnet to the back of them to make some super cute decor for your fridge. They would make adorable game tiles too. 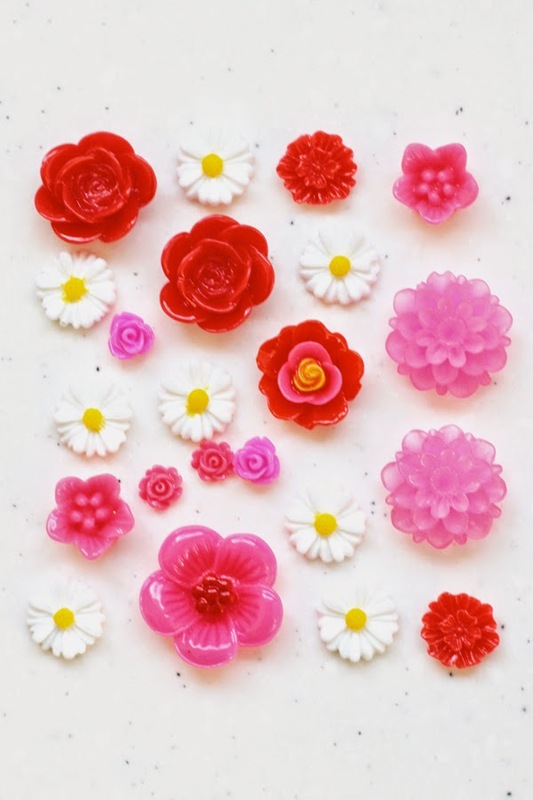 Are you in love resin flowers too?? What sorts of things have you made with them? I first started working with resin about a year ago and have absolutely loved it. Although I’ve found it a little challenging at times (spillages, bubbles, resin setting too fast, or not setting at all), the results have been well worth it. So I thought it was about time I started some tutorials here to hopefully inspire you to try it out too. This is a beginner’s resin tutorial on the doming technique. Although its reasonably easy, I suggest that if you are completely new to resin that you first try casting into moulds (just to help you get a sense of the resin). I hope to do a tutorial on that in the coming weeks (I have something coming that I’m just waiting to arrive). There are some great tutorials on youtube for beginners so I recommend looking there. 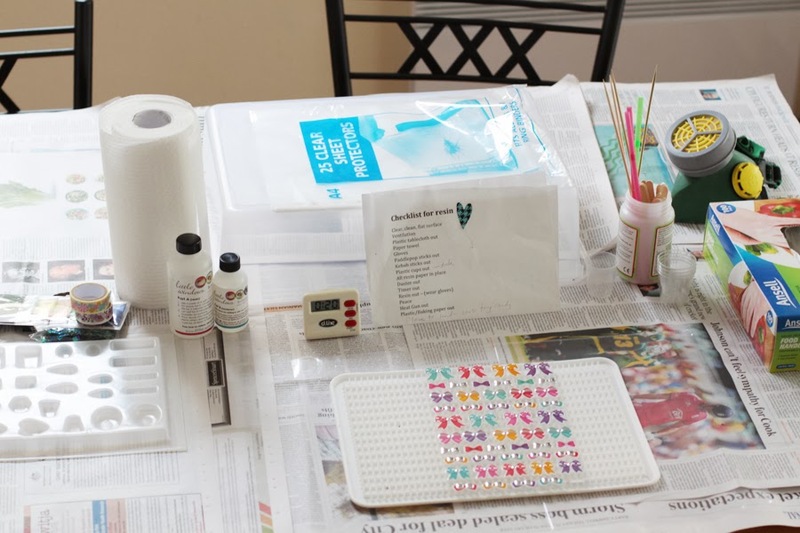 Jeweller’s Resin, Plastic Coated Stickers (or any flat image – see note just below a bit), earring posts, stirring wands, small measuring cup, timer, rubber gloves, paper towel, plastic sheet (from display book) or a doming tray, plastic box to cover resin from dust, kebab sticks, a fine-tipped marker pen to make the measuring cup, gas mask (if your sensitive to fumes). 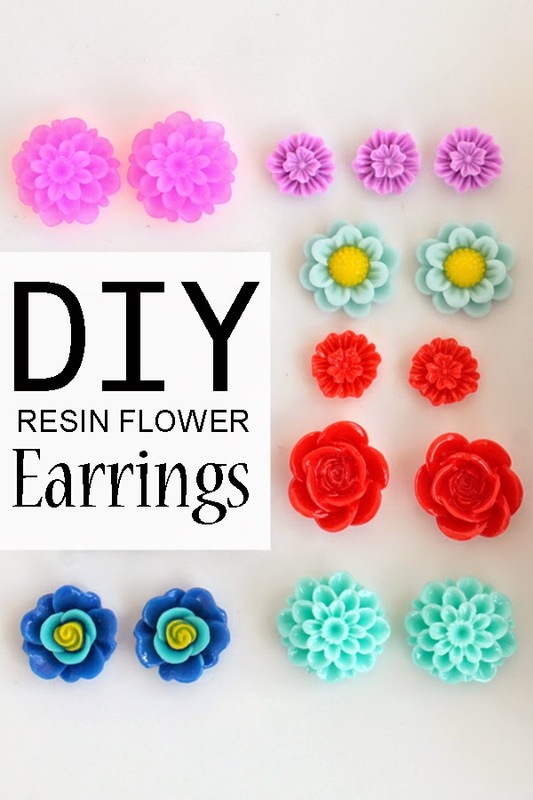 You should be able to buy jeweller’s resin from most craft shops. Most resin kits come with measuring cups and stirring wands too. You can get it online in Australia from Over The Rainbow. In the States I know Fire Mountain Gems sells some, Amazon too. Little Windows Resin (my favourite so far) is available through their website. They ship internationally, have great prices and great service too. They also have the most amazing resin supplies. Certain Resins can give off toxic fumes, so you’ll need to work in a well ventilated area. If you’re working outside you need to make sure that your work surface is completely flat and that nothing will blow away. I personally find it too difficult working outside. Wearing a gas mask can help and even some clear glasses if it irritates your eyes too much. One of the reason why Little Windows Resin is my favourite is because it’s non-toxic and really doesn’t give off any fumes at all. It uses less chemical hardener, and doesn’t contain solvents or the usual nasties. It also gives the best results and least amount of bubbles than any resin I’ve tried. 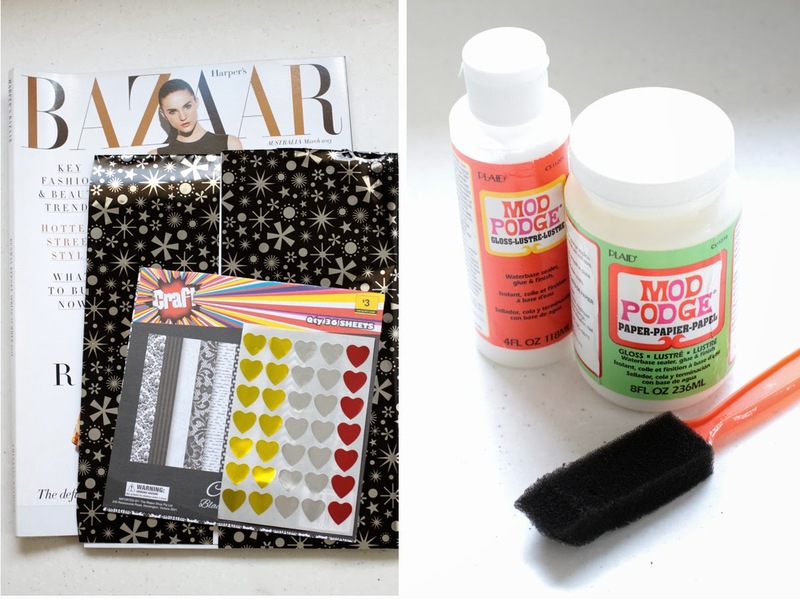 When working with resin I find it’s really important to have everything in place before you start. Once you’ve mixed up a batch you’ll have approximately 20-30 mins working time – so you need to move quickly. Having everything in front of will really help, especially if you are just learning. This is my set-up here, if you can see I even have a checklist I use to make sure I’m completely organised! (It’s easy to forget things) Once you’ve made the resin you won’t want to move it for at least 12hours, so make sure you work in a space that you can leave it. 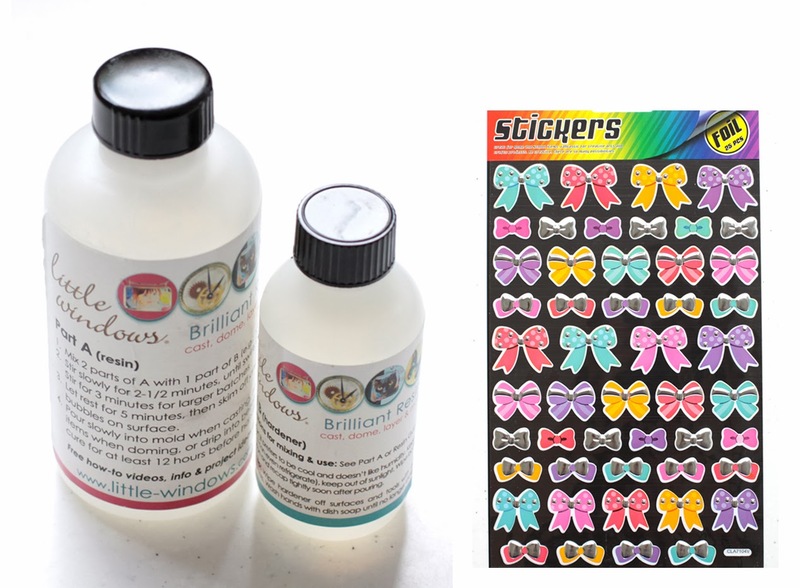 Instead of stickers you can use anything – magazine clippings, photos, drawings, paper stickers, wrapping paper etc. You will just need to coat them back and front with a couple of layers of sealant, such a Mod Podge (I like the paper one/green label best). You may need to flatten them in a book afterwards as they tend to curl up. 1. 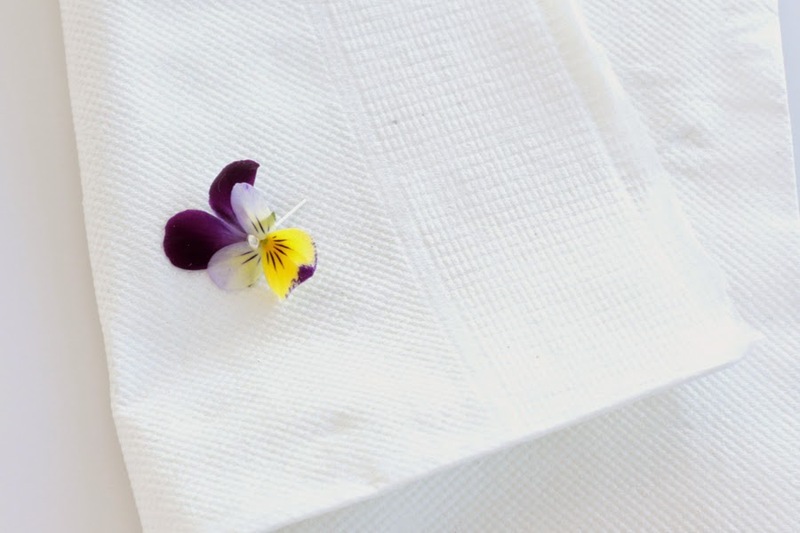 Place selected pieces on a doming tray or sheet of plastic (I just use an A4 pieces from a display book). A doming tray catches any spilt resin so that it won’t stick to your pieces. If you’re just using a sheet of plastic make sure to spread the pieces out (more than pictured) so that if you do spill any resin (it does happen) it won’t disturb the rest of the pieces. Take a chance to check for any dust on the pieces too, use a blower brush or a soft cloth to wipe any that need it. 2. Mark the measuring cup for both the amount of resin and hardener you’ll need according to your resin’s instructions (most resin’s are a 1:1 ratio, the one I’m using is a 2:1 though). Mix the the resin SLOWLY, if you mix it too fast you’ll get lots of bubbles. Also make sure to scrape the resin from around the sides and from the spatula into the cup every once in a while so that it’s all mixed evenly. For a small batch like this I usually mix it for about 3 mins, until the swirls disappear and the resin clears. 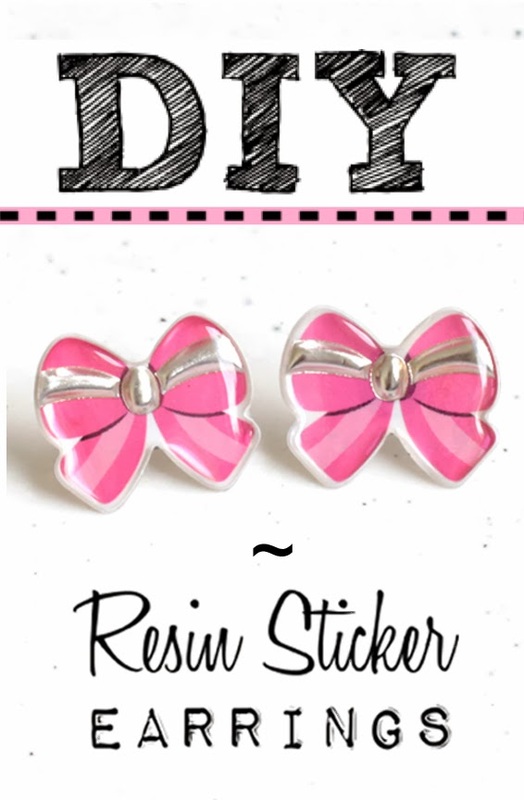 Leave the resin to rest for about 5mins (check your exact instructions for this too). After it’s rested you can remove any bubbles from the surface with the spatula. 3. 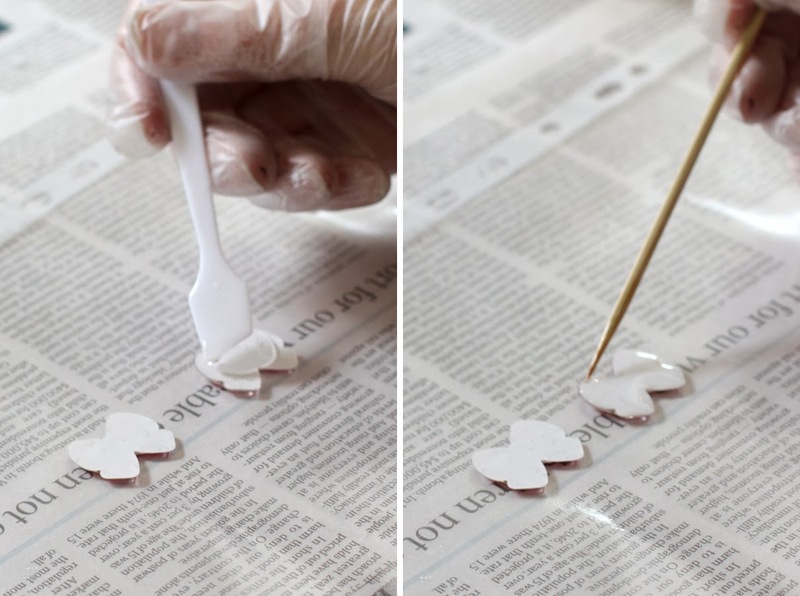 Carefully get a small amount of resin onto the spatula and let it drip over one of the stickers. 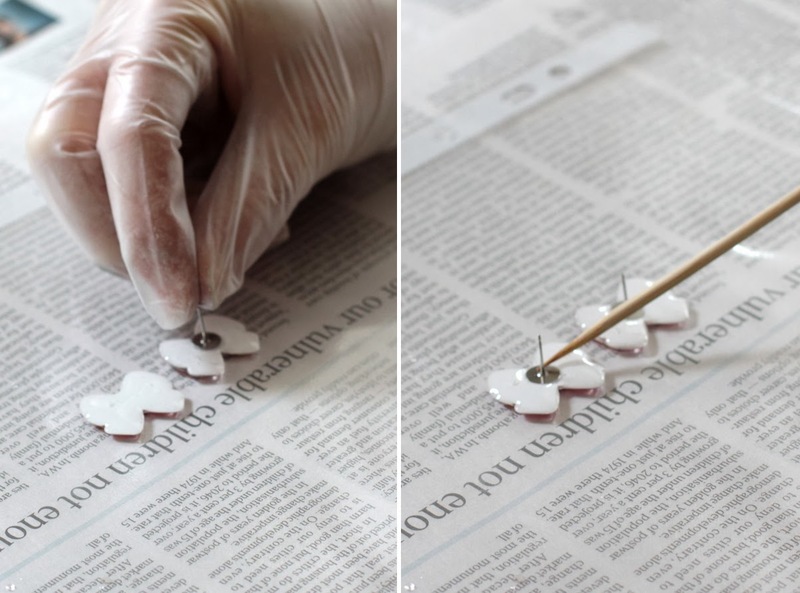 The resin will form to the exact shape or your pieces. When it hits the edge, it will stop. As long as you don’t put too much on it won’t overflow. If you do have resin that overflows and you are using plastic or a lower doming tray, you will need to move the piece to a clean area of the board so that it doesn’t stick. 4. If the resin doesn’t find the edges of the stickers by itself you can encourage it with a toothpick or kebab stick. 5. 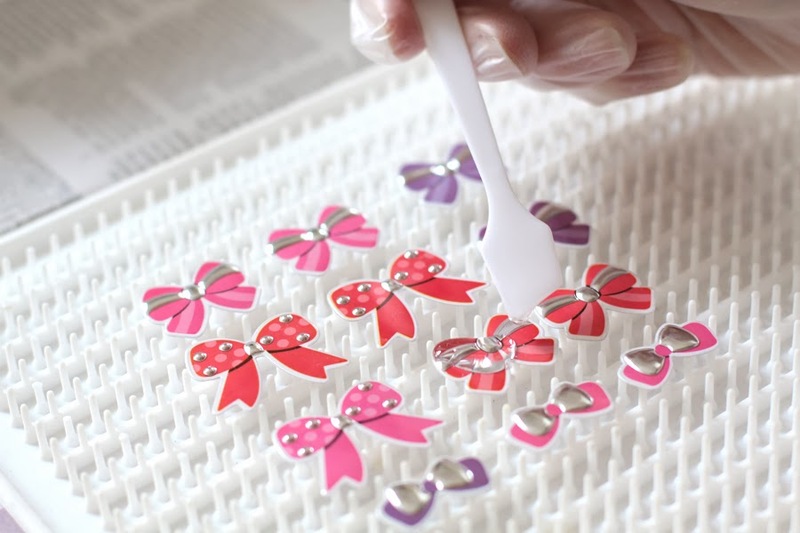 After all the pieces are done, cover them with a plastic box or container to prevent dust. 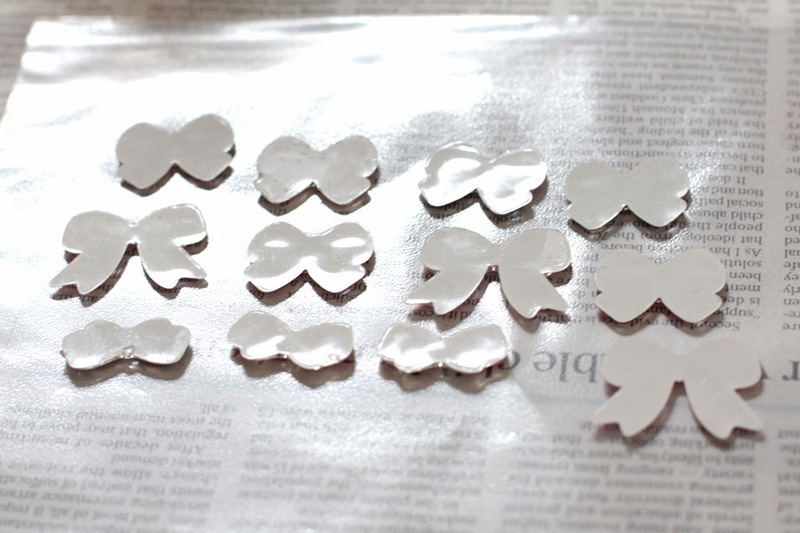 Let them dry for at least a day. 6. After a day they will ready to touch. Don’t worry if they are still a bit pliable (the resin takes a few days to harden completely). 7. 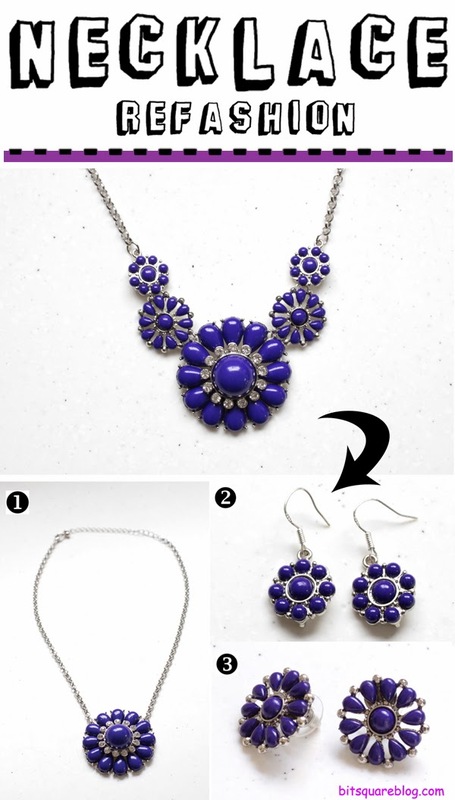 Set up your work area as before, make sure to have earring post findings on hand too. For the reverse side I do them straight onto plastic as the curve of the set resin makes it harder to position them on the doming tray. You should spread these out more than I have here too as it can get messy. I forgot to think about this for the photo – whoops! 8. Spread out the pieces like I’ve done here. Drip resin onto the pieces as before, using a stick to move any up to edges. 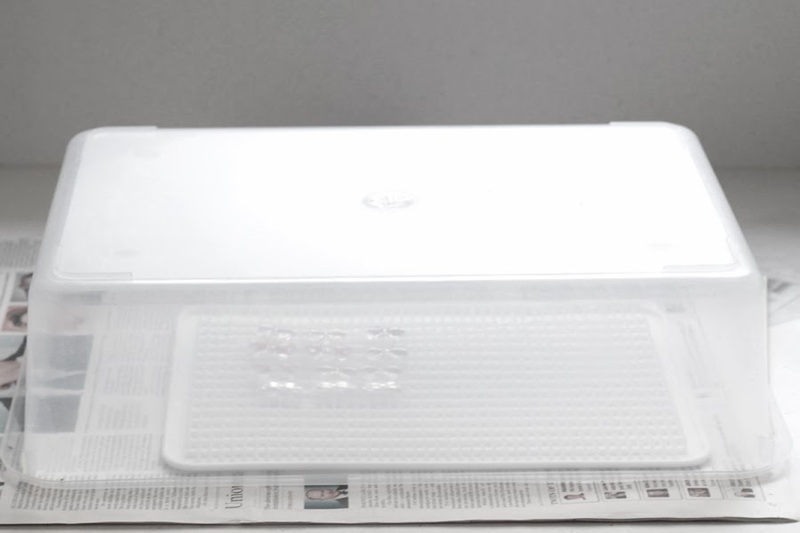 You’ll probably only want a thin layer of resin for the back. If you like, you can colour it with resin dye, oil paint, glitter or mica powder. I just left it clear for these. 9. Drop a post finding carefully in the centre. Position with the kebab stick. It should stay in place. If you are worried about it moving though (sometimes they do slightly), you can always glue it in place before hand. 10. Let them to dry under the plastic box for another day. They are ready! They worked out really well I think. I was slightly worried that the resin might seek through the sticker backings and darken the design somewhat – but it didn’t. As you can see I did stuff a couple up – the two in the front I spilt resin over so they ended up completely flat rather than domed. They they still look ok but I didn’t bother putting studs on them. As the resin shortens the length of the studs slightly you might find you can only use the nut backs (as pictured) or smaller plastic backs rather than large, circular comfort backs. See how you go though. You can always stick the posts directly onto the backings after the resin’s dried too. I hope you enjoyed this tutorial. Resin is really fun and definitely worth something to try out as the results are so lovely and look so professional too. Don’t be disheartened if this takes you a couple of goes – it took me ages to get consitently good results with this. If you have any questions or problems don’t hesitate to contact me, I’m always happy to help. In the last few years or so I’ve worked out a few formulas to help me pack for a vacation and also to help fill in some gaps in my wardrobe. 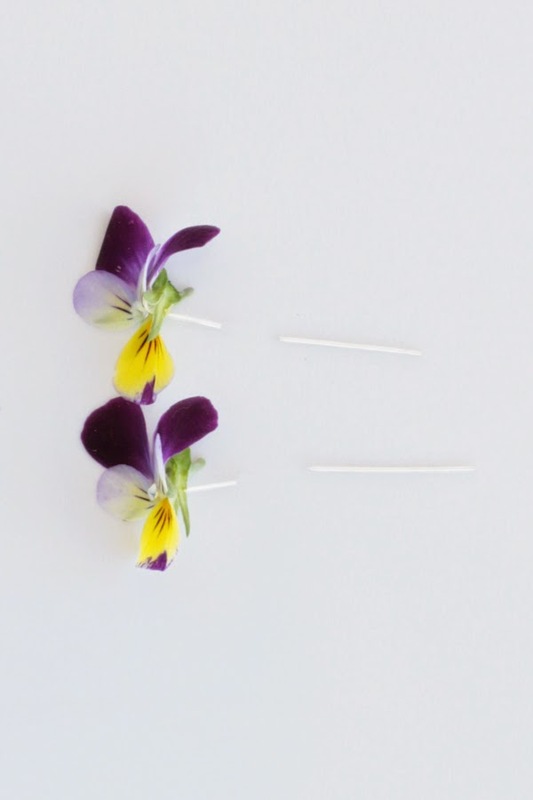 Today I thought I’d share an earring formula that helps me work out the best choices to take. 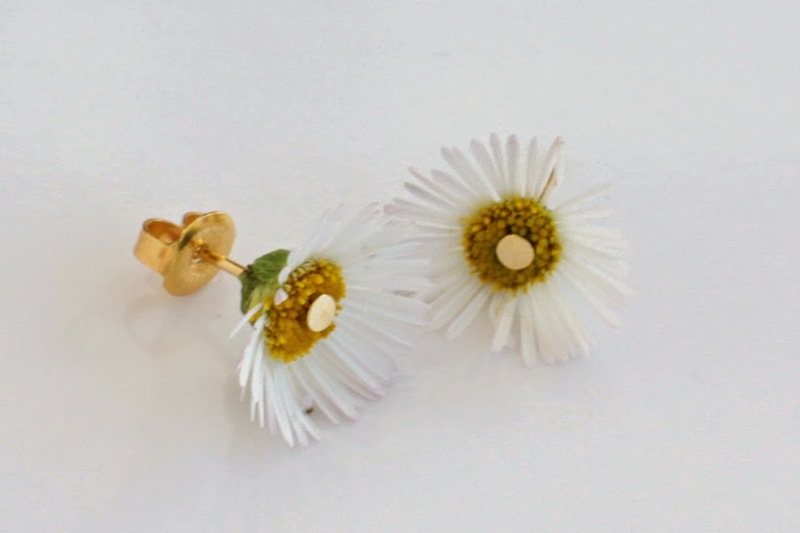 A BASIC NEUTRAL – Something simple that will go with everything, including a necklace, like a round stud or a small drop, generally metallic but not necessarily. 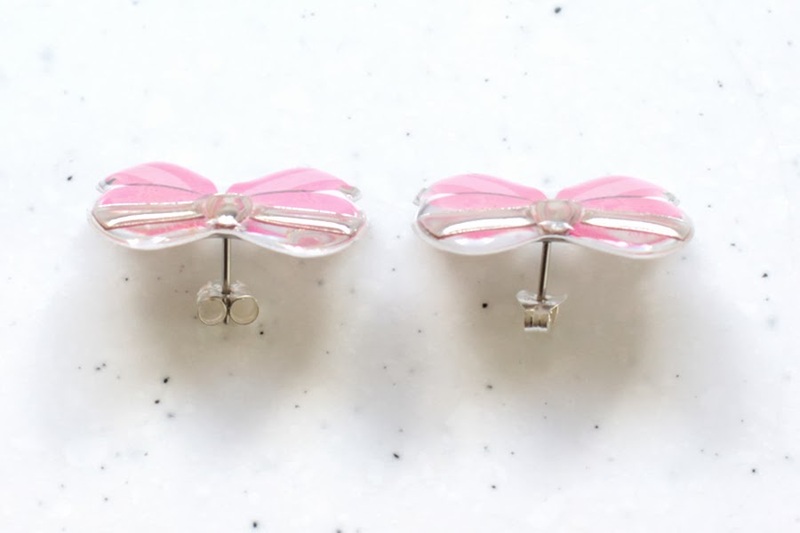 A DRESSY NEUTRAL – Another simple earrings but a little bit more dressy such as a pearl or something with some sparkle, usually a post earring. A POP OF COLOUR – a solid pop of colour of a favourite colour, something that will go with the majority of your wardrobe. 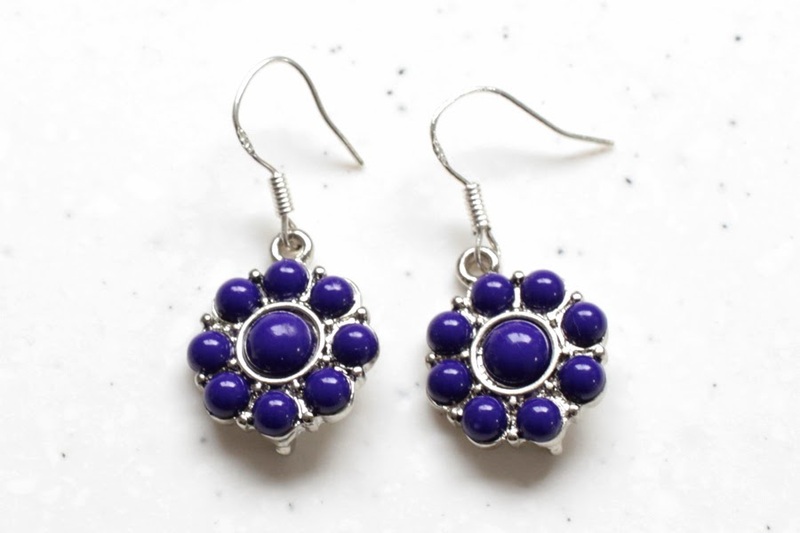 These are usually a statement post or a single beaded earring. 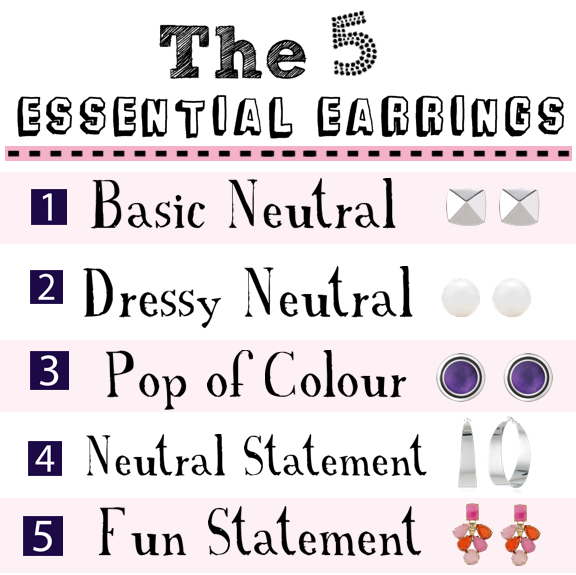 A NEUTRAL STATEMENT – A larger neutral earring, usually metallic too, that is fairly simple such as a hoop, tassel or disc. 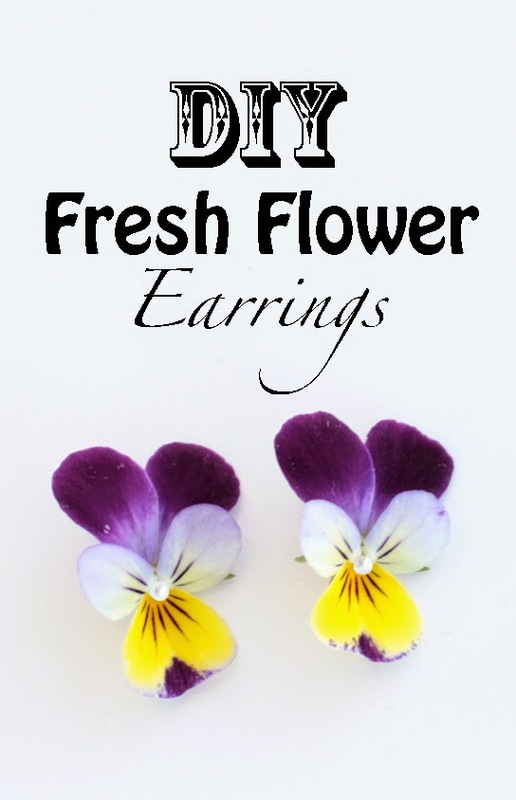 A FUN STATEMENT – An earring you love wearing just because it’s awesome, something that will make a statement on it’s own and look great with a basic tee. These can be single coloured, multi-coloured, patterned, textured, whatever you like. 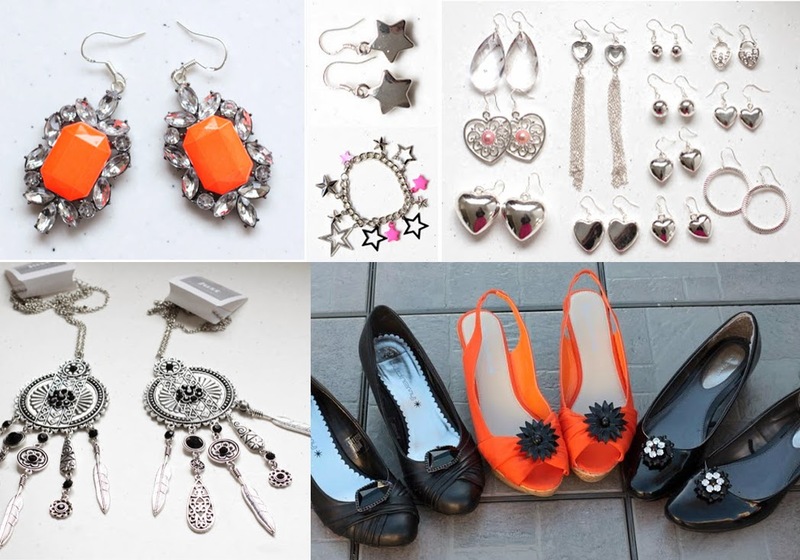 These are a few of my favourite earrings and ones I wear at lot of. I would say I wear a basic neutral about 40% of the time. I think it’s really important to have a few great neutrals that you absolutely love, they are really the best types of earrings to invest in. 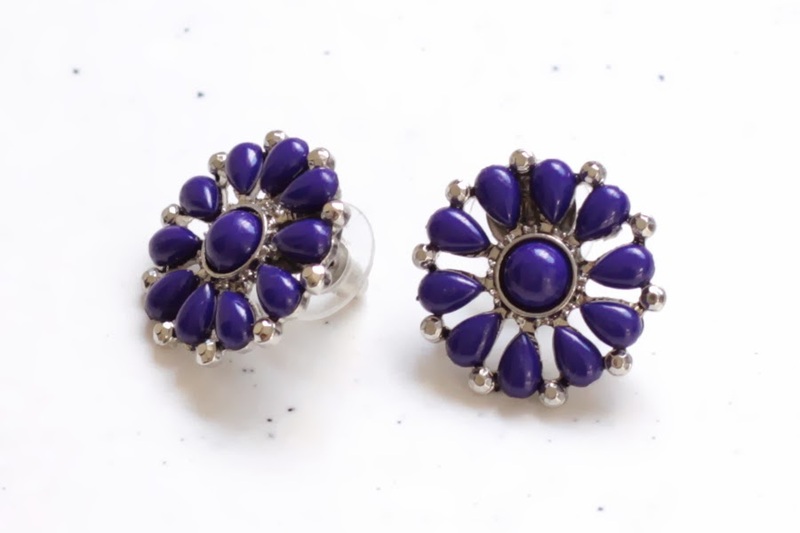 Whatever colour I choose as my ‘Pop of Colour’ earrings, I’ll try to choose a ‘Fun Statement’ earring in the opposite colour i.e. a cool coloured pair and a warm coloured pair. This gives me more variety with my outfits. What do you think of this formula? 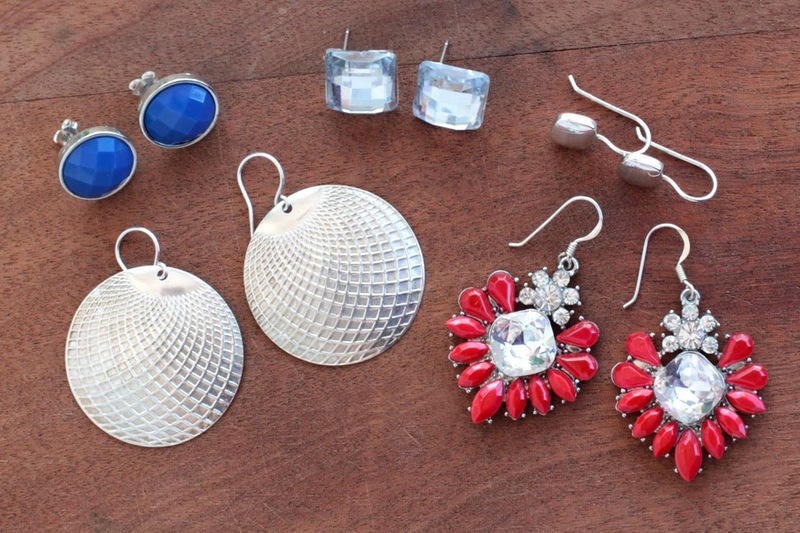 What would you consider as your essential earrings? I recently bought this wonderful necklace from Coles Supermarket. 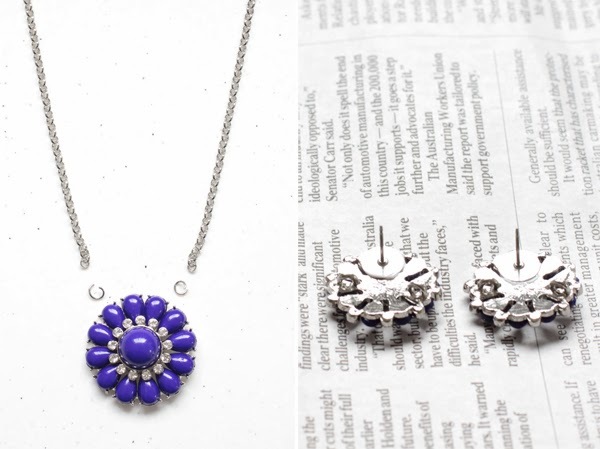 It’s an absolutely gorgeous colour – a deep, vibrant purple with a hint of cobalt blue. 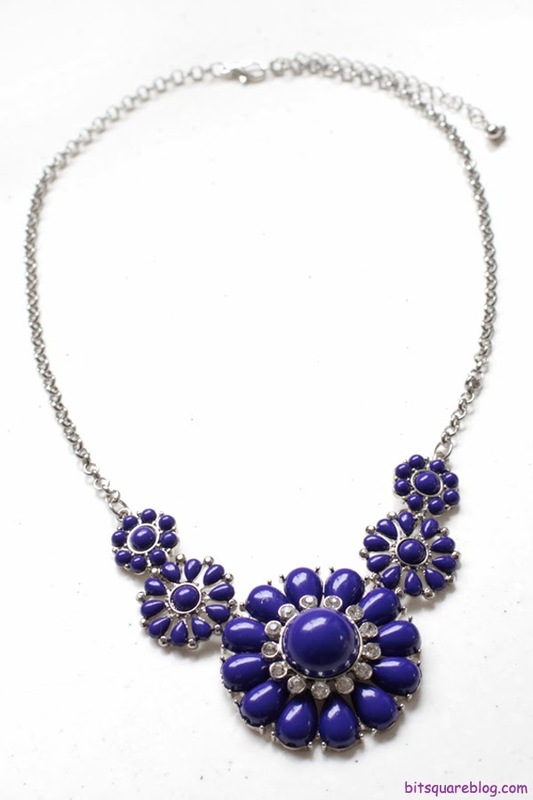 I’ve been on the lookout for a lovely purple necklace for quite some time now so I was very happy to come across this one. Although I love the design too, I found that I just couldn’t make it work for me – I’m more of a fan a larger scale, statement pieces and this one just seemed to get lost on me. I thought about taking it back but I just loved this purple so much (it was a great price too) I’d thought I’d have a go at refashioning it. As you can see the pieces were joined together with jump rings. 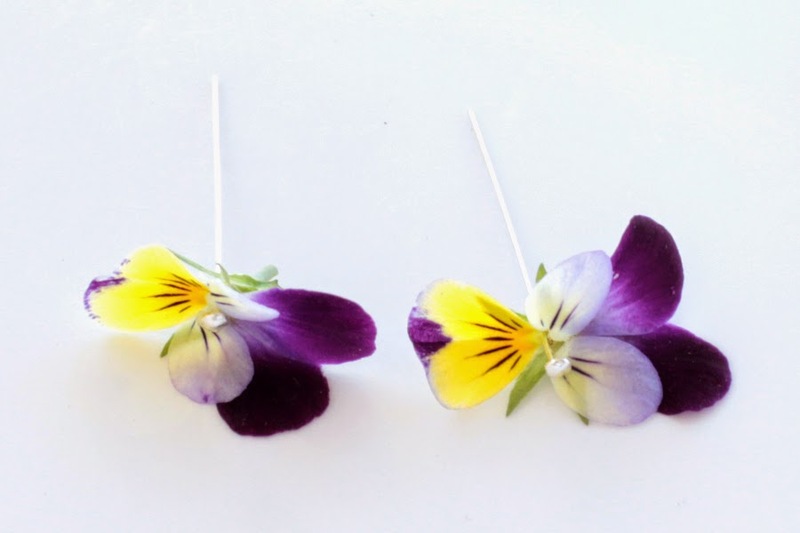 These were easy to pull apart with my jewellery pliers. 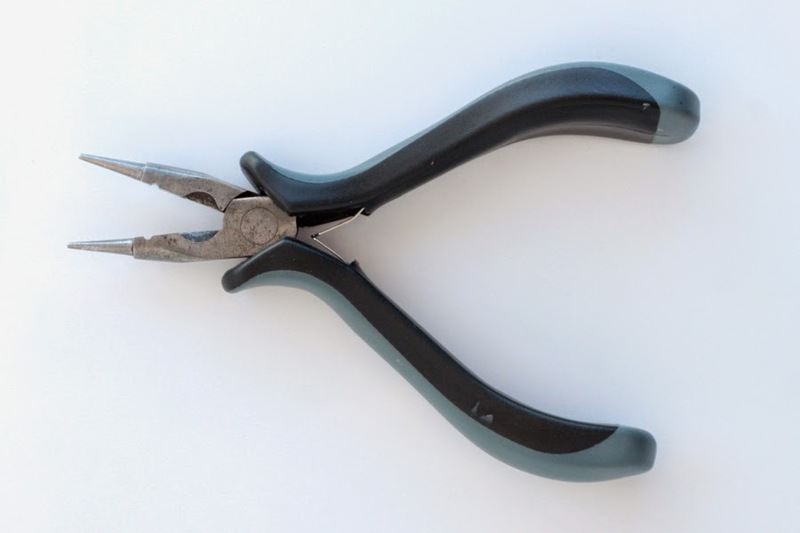 (I have some more information about pliers here). 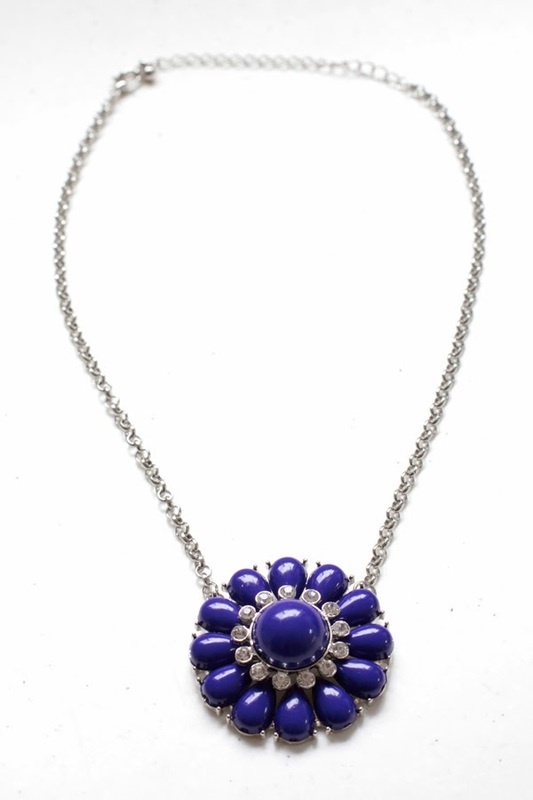 I choose to use the central piece to make a statement pendant necklace, which I simply reattached to original chain. 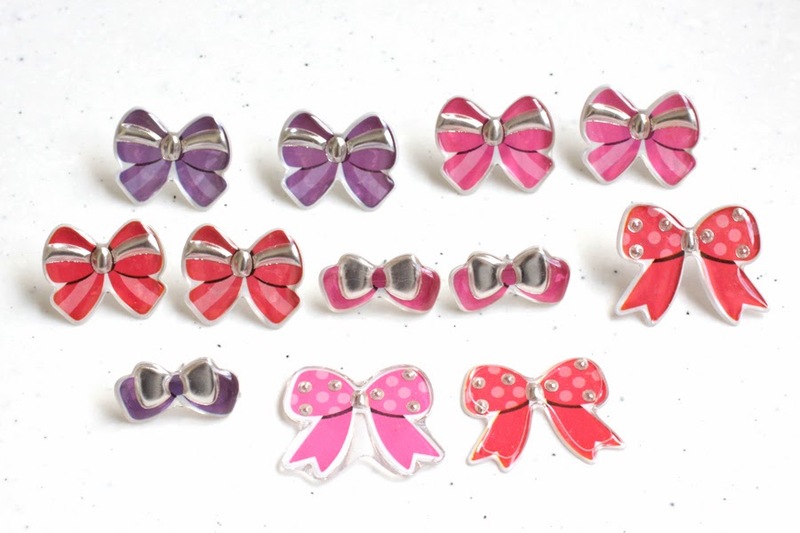 I then took the two medium pieces and glued stud findings to the back of them with superglue (see this post for more info on how to make basic stud/post earrings). I left the little join rings on them just for now but these are usually easy to cut off with jewellery pliers (it can sometimes just leave the finish a bit sharp, which is why I left them on here – you can cover sharp bits with some more superglue though). For the last couple of small pieces I just added some earrings hooks as they had the perfect attachment (info about attaching earring hooks here). I am absolutely in love with this necklace now! Even though the main reason I wasn’t wearing it before was that it felt too small on me, in simplify it, it actually makes a much greater statement. I love it with a simple black tee, yesterday I wore it with a striped V-neck too. My other idea for refashioning this piece was to make it into a brooch, it would be the perfect size for that and nice and simple too. I also adore these studs. I love their statement size, yet they are still nice and light and comfortable to wear. I was worried that the post findings weren’t going to be large enough to stick to them (it’s best when making studs to use the largest finding possible in relation to the earring bit). They are perfect though and I’m sure I’ll get a lot of wear out of them. That’s it – I’m really happy with this refashion. I always love making jewellery from other bits of jewellery. It’s so fun to have such unique pieces. If you’d like to do a similar refashion I suggest looking at Forever 21 or Target USA (or Target Australia)- they both have lots of similar styles at low prices. 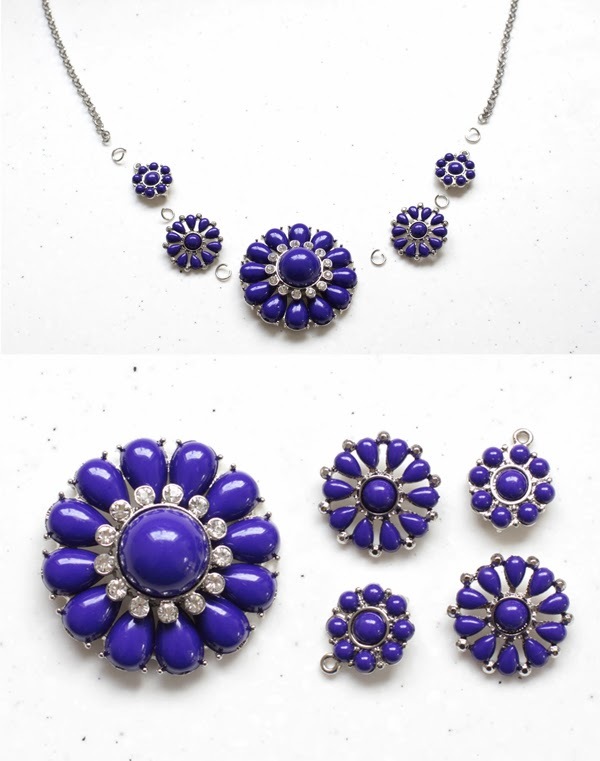 Ebay is of course another great place to buy cheap statement pieces that are great to refashion. What do you think of my refashion? 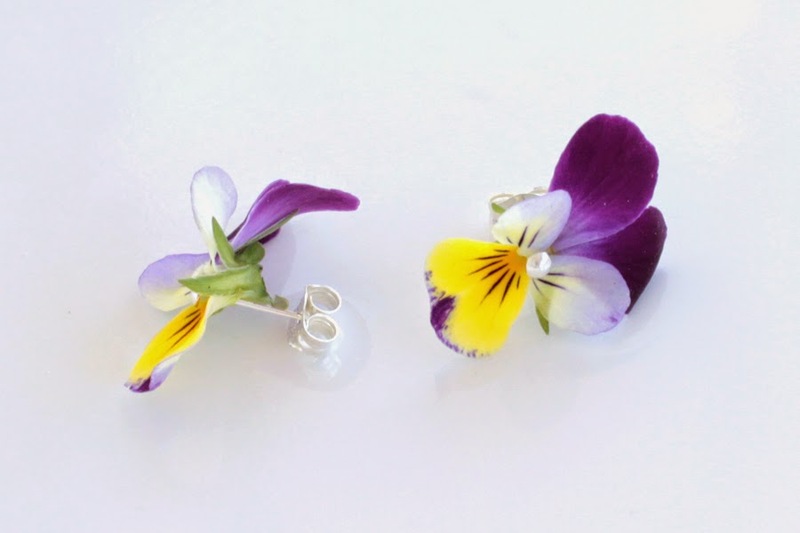 Have you ever refashioned jewellery into new things??? So all I did was cut out two little circles from one of the white pieces of foam and glue them over the bumps – it took 2mins. 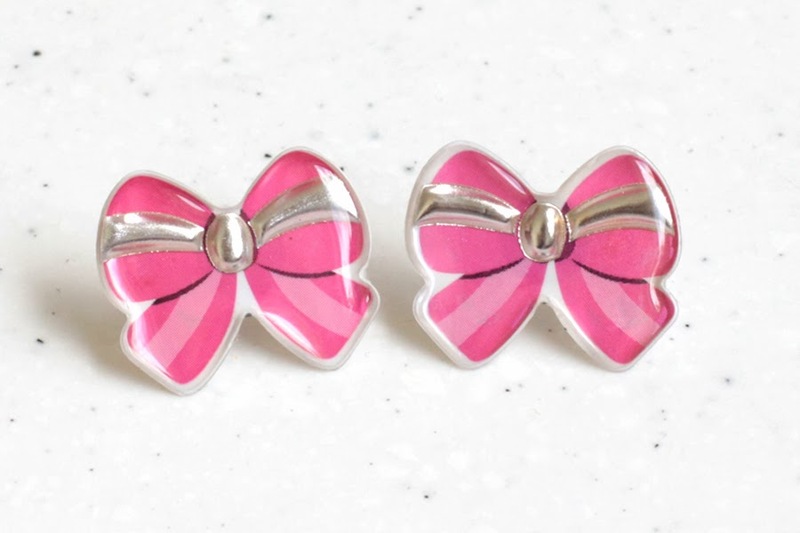 They seem pretty secure and make the earrings considerably more comfortable. I am noticing that the foam is flattening over time so I may need to replace them every so often – which really wouldn’t be a hassle at all. Hopefully this helps! I imagine this would work with other clip-ons too. The pinch was slightly firmer after putting on the foam but the clasps on these particular ones were a little looser than usual. 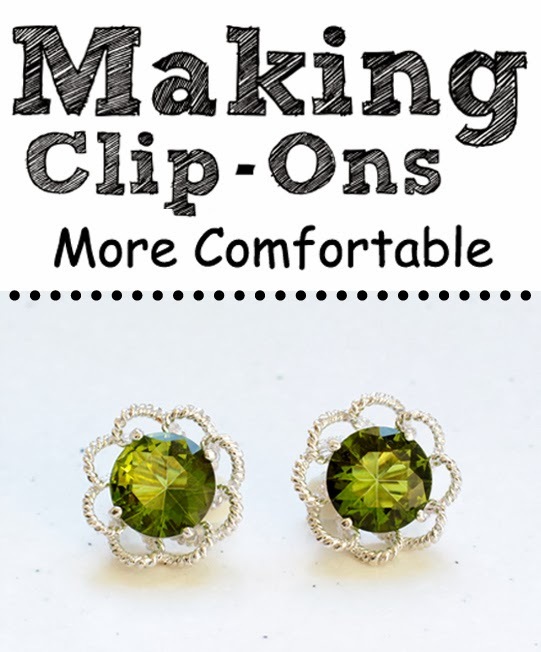 How do you like wearing clip-ons?? Do they tend to hurt your ears too? PS: I did a post earlier about Sterling Silver Clip-Ons which I’ve found much more comfortable.